When The Sisters Brothers ended up being a box office bomb in the States – it ended up making only $10 million next to its $38 million budget – despite solid reviews from critics, there was a little bit of worry that its financial underperformance would deny it a UK theatrical release; in the past, movies that have done badly end up going straight to streaming services in other countries, or left to die a quick death via direct-to-DVD distribution, so to have the same fate happen to a film like this was not entirely unbelievable. Thankfully, it seems that the positive word-of-mouth, not to mention the star power of popular actors like John C. Reilly, Joaquin Phoenix, Jake Gyllenhaal and Britain’s own Riz Ahmed, have won the day, and UK audiences are finally able to see director Jacques Audiard’s ambitious Western for themselves. Even more thankfully, the film remains a strong genre movie on a second viewing – after a first-look preview during last year’s BFI London Film Festival – that people can get behind just fine. Reilly and Phoenix are the Sisters Brothers of the title – Eli and Charlie, respectively – who are ruthless hitmen in 1851 Oregon working for the powerful Commodore (Rutger Hauer). They are tasked with hunting down a chemist named Hermann Warm (Ahmed) who has developed a chemical formula to find gold, but things become a little more complicated when Warm is assisted by John Morris (Gyllenhaal), a private detective also in the Commodore’s employ who ends up sympathising with Warm’s plight. Regardless, the brothers travel across California to find Warm and complete their mission, while also dealing with their own problems such as Charlie’s rampant alcoholism and Eli’s growing guilt and disdain for their deadly line of work. Perhaps the reason why US audiences just didn’t click with this film – other than the fact that, sadly, the Western genre is not as popular as it used to be – was because it has a very European flavour to it; director Audiard, a French native, doesn’t concern himself with presenting a vision of the Old West that falls into line with the accepted portrayal thanks to the likes of John Wayne and Clint Eastwood, but rather makes it the backdrop for some deeper and more artistic themes with a pacing that’s not unlike the director’s previous French-language films. His focus is a lot more on the grittier side of living in this time period than a more romanticised version of it, such as how gruesome and harsh this environment can be to the unsuspecting soul; one of the film’s most uncomfortable scenes – at least, it was for the audience I saw it with – is when a spider casually crawls into Reilly’s character’s mouth as he sleeps, leaving his face swollen and prone to disturbing nightmares, before later vomiting up tiny spider eggs. It’s gross, unnerving and the exact opposite of what you’d find in a standard Western movie, which is entirely what Audiard seems to be going for here, in an ambitious and laudable attempt to give audiences the exact opposite of what they may have been expecting here. Financially, that move seems to have backfired, but it by no means undermines the respectable approach that has been taken with this film. I brought up in my previous review for this movie how the performances by the main cast, particularly Reilly and Phoenix as the brothers of the title, are all very strong and memorable turns from actors who have largely done nothing but strong and memorable turns in the past. I stand by that statement, with Reilly and Phoenix not only sharing a believable brotherly chemistry but also turning in some wounded and vulnerable performances on their own, and Gyllenhaal and Ahmed being solid supporting players that are highly sympathetic, even when you feel they can be at times pompous and perhaps a little too sure of themselves; Gyllenhaal adopts an accent with a twinge of British about it, perhaps to hone in how high-class he considers himself to be despite working for people who are by all accounts not good folk. These actors all carry the movie perfectly well, and they leave you interested in where they are taking their characters next while also allowing their uglier sides to show with little sense of vanity. By the end, you’re interested in seeing a lot more adventures with these misfit brothers, even though its financial underperformance – not to mention the fact that it’s based on a singular book by Patrick deWitt – more or less confirms that’s never going to happen. The violence, the dark comedy, the aesthetic, and the increasingly harsh depiction of horses – Reilly’s horse just can’t catch a break, being left partially blind by a bear attack and then having its open wound infected and filled with pus before a final, undignified bout with fate – are what help make The Sisters Brothers a very well-made and entertaining Western that doesn’t sugar-coat how unpleasant life in the Old West could be, with just about everything from the wildlife to the bitter weather setting out to kill people at any given moment. It’s easy to see why it initially struggled to find an audience, because it’s not really the kind of Western people usually expect to see on film, but that’s part of what makes Audiard’s movie a low-key stand-out of the genre; the fact that it doesn’t do half of the standard Western clichés and instead does its own thing with a decisively European flavour is a perfectly good reason to give this one a chance. 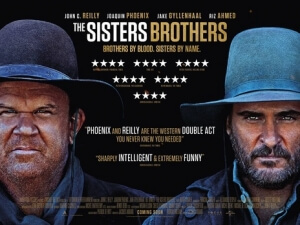 The Sisters Brothers is a unique entry into the Western genre that director Jacques Audiard injects a healthy dose of European flavour into, which may put off some purists of the genre but a strong and ambitious aesthetic as well as some strong performances keep the film sitting firmly on horseback.